When I first began doing speed traces, the very first one I did was to remove a certain tone from my voice when I got angry that caused physical pain to my wife, Del. In removing the tone, I had to hold my gut taut as I went down the time marks, so I knew that in order to generate the tone, my stomach muscles had to be very tight. It was an automatic thing for me, which I had come to understand from my emails with Doyle Henderson was a physical body state, what I came to call a doyle. Remember this was my very first trace, so I hadn't developed the formal concept of the Plausibility Question yet. Even so, it became clear to me that my gut first got taut like that when my dad yelled at me as a kid under five using that same tone of voice. Seems that in order to not feel pain when that tone is blasted at you, one must have a doyle stored that immediately steels one's gut in protection. Del's gut hurt because she didn't have that automatic doyle stored in her before five. Neither me nor any of my siblings have a problem with that tone, and we all have used it at one time or another. I suspect that the older ones, like me, use it more than the younger ones who came along when my dad was older and more relaxed with life. When I was born he was walking the Mississippi River levee five miles to and from work every day during the early years of World War II when new cars were not being sold, and few newly-weds could afford used cars. Weeks after that first speed trace, Del and I had just sat down in our favorite restaurant, Bailey's in the Fairmont Hotel, and our favorite waiter Darren brought us a complimentary hors-d'oeuvres. It was in a small bowl with a scoop of something that looked like tuna fish salad in it and some crackers on the side. We began eating it, and I found it to be quite delicious! I said to Del, "What do you suppose this delicious stuff is?" She said, "Chicken liver paté." I was astonished and perplexed! Never in my entire life had I ever eaten anything contained even a slight trace of liver and enjoyed it, especially chicken livers! Even a crumb of chicken liver in a dirty rice, a Cajun name for rice dressing with giblets, and I wouldn't eat another bite after testing it on my tongue. So how in the world could I be eating chicken liver paté and loving it? My mind boggled. I refused to accept Del's judgment — she is very trustworthy with her taste buds, she is the taster in Bobby Jeaux's Kitchen, but I couldn't believe it was true — everything in me rebelled from the prospect that I was eating and liking liver. When Darren walked past our table, we had still not ordered, I asked him, "Darren, what was that stuff in the bowl?" I pointed to the bowl that I had moments before wiped clean with a piece of french bread. He looked at the bowl and said, "Chicken liver paté. You want some more?" He turned and left me with my mouth open — my jaw fell as he said the words. Del smiled that smile that wives smile when their husbands learn that their wives were correct all along. Darren brought the second bowl of paté and I ate most of it myself and wiped the bowl clean. We finally ate other stuff for our meal, but my mind stayed focused on this incredible happening. Completely inexplicable to me. What on earth could have happened to me that suddenly, out of the blue, I had begun to like liver? The next day I began writing up my experiences with these new foods in an email to Doyle Henderson. Somehow he might have a clue. This began months of emails about food dislikes. I did a search of those emails — found 100 of them dealing with the topic of "food dislikes. "(1) The information he shared led me to understand that food dislikes are physical body states, that is, certain areas of tension in the body and not a dislike for the taste of the food, as is the consensus. What one dislikes is the tension that arises in one's body automatically when one smells, tastes, or even thinks of the food! That tension is a doyle and easily removed by a speed trace. Pieces of the puzzle were beginning to fall into place — the puzzle, the unanswered question, that I'd been holding about why I suddenly began to enjoy liver and sauerkraut. If I had done a speed trace on either of them, there would be no puzzle. What was puzzling was that I hadn't done a speed trace on them, in fact, I had done only one speed trace, and that on the tone of voice I used when I yelled. The tone of voice my dad used when he yelled at me and installed that doyle in me before I was five-years-old. Somehow a tone of voice doyle was connected to a food dislike, but how? Doyle talked about his "combiners" — these are combining events during which a previously stored doyle gets attached to some new context — like an anchor works to attach two events in NLP talk. It made sense to me. I pondered that for a long time, and gradually a picture began to emerge for me of a tree of leaves associated with a single doyle. The root or trunk of the tree was a doyle, a physical body state stored before one was five-years-old. As one grew up past five, events happened that attached the doyle to new triggers. I might have been sitting down eating supper one night, enjoying some new food, some sour cabbage stuff that Mom had served a couple of times before to us. Strange, but okay stuff. Only this particular night, Dad had just awakened from sleeping to get ready for his graveyard shift from 11 PM to 7 AM, and he was hungry. As he sat down, he saw what Mom had fixed and said, "What's this? Sauerkraut! I hate that vile stuff!" BANG! There was his strident tone of voice. My gut tensed automatically due to the doyle that fired off. The gut tension had now been associated with the smell and taste and look of sauerkraut! Never again would I be able to enjoy sauerkraut in my entire life until I would be over fifty-five years old! And what would happen is that I would trace the tension in my gut to remove the doyle, and thereafter I'd be able to eat not only sauerkraut, but liver and enjoy eating them both for the first time in over fifty years! The whole process fell into place for me: when one does a doyle trace, one chops down the tree and all the leaves die! The leaves are the contexts in one's life where the root doyle was attached during combining events or anchors. Thus a simple speed trace can improve one's life in many unforeseen ways! A simple trace of a food dislike for me would have removed the strident tone of voice because the tone stemmed from the gut tension that prevented me from enjoying liver or sauerkraut. Not only was a food dislike simple to do and to confirm afterwards, but doing a simple food dislike trace could save one the time and expense of many years of psychotherapy! I began to compare a doyle trace to the process of therapy as I had experienced it. A therapist would remove one or two leaves from the tree during a session and close the session by saying, "You will need to come back twice a week until you're done." The therapist knew that the client had a tree full of leaves to be removed, and that it would likely takes weeks or months or years to remove them all, so they'd better meet twice a week. If the process took too long, the therapist knew well, the client might not survive, so speed was essential. With the advent of the speed trace, the removal of a root doyle and its tree full of leaves can be accomplished in under sixty seconds. And it can be done by a person without the use of a therapist. I have a lot of respect for therapists, however, and I know when a newer tool is available that they will quickly learn to use it, and their services will be needed to assist their clients in learning to find the root doyles to be removed in their lives. 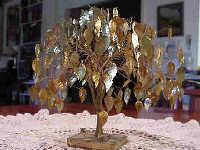 This is the story of the Golden Leaves Tree which you can see in the photo — each leaf represents a context, some set of stimuli that triggers a doyle in a person's life. A sixty-second doyle trace can chop down the entire tree and all its leaves die. Therein lies the power of the speed trace, rightly understood. "You may have (not yet sure) made a major contribution to the process — I have already suggested to two new customers that they start out their first tracing session using some food dislike, distaste — and certainly they won't worry about getting rid of some food dislike when they know that they don't have to eat it if they still don't want to. The process won't change their choice — just allow them to realize they don't have the emotional dislike anymore — that's a good thing, right? I am so excited about it I can hardly wait to change the text telling users to start with the feelings and body states associated with dislikes of specific foods — with frowning, facial distortions, tightness in the throat, any nausea, vomiting tendencies, and/or stomach tension — or other states — as applicable. Of course, generally, the states are either fear or other direct physical unpleasantness. Fear, itself, comes from illness or injury, or other unpleasant conditions not necessarily called an illness or injury — such as hunger, teething, being cold or too warm, etc. Some people may have irritated, angry feelings — which also originate with injuries, illnesses, or other discomfort. Eradicating the food distaste first is a super-colossal idea — and, of course, if done properly, may result in the eradication of the basic unpleasant states which ALSO cause fear, anger, etc. Program users, alone by themselves may be reluctant to work with some severe emotional states — so the idea of starting with a food distaste may be a real winner. Yet, great benefits may follow — all according to the concept."